Images and information for this article provided by Daren Wilde, Kim Zoll, Tyler Ham, and Joseph Yglesias. Special thanks to Pablo Artesi for being the hardest working collector in Argentina. 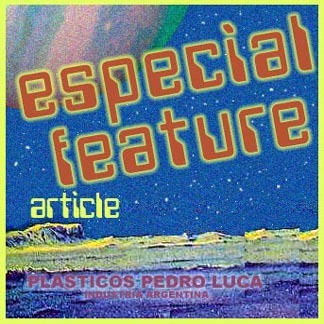 Plasticos Pedro Luca (PPL) was a toy company operating out of Argentina that specialized in space toys. It is thought that the company was in business during the 1970s and 80s. PPL was virtually unheard of until a carded Darth Vader bootleg came up for sale on a popular auction site. Many of the ones in today’s market originate from 2 seperate sources. The first source was the seller that auctioned the Darth Vader, a store owner from Argentina who was cleaning out and auctioning old inventory. The second source was a collector from Argentina. The collector was intrigued by the appearance of a Star Wars bootleg from his country that he did not know about. He set out to begin an investigation into this new line of figures. 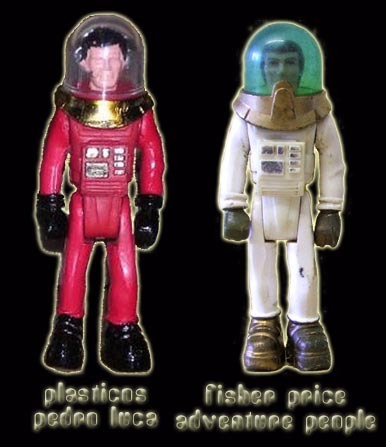 After a bit of research he found a contact that collected space toys and owned a number of these figures. Thanks to his hard work, and the luck of the store owner, many of the figures from the line have been identified. The Plasticos Pedro Luca line of figures has at least 4 Star Wars-based figures with several color variations of each. These can be further broken down into 2 styles. Those based on Darth Vader and those based on astronauts. The first style is the Darth Vader style and it comes in 2 varieties, one with Darth Vader limbs and one with Stormtrooper limbs. The first variety has only been found in one color and comes labeled Brigadier Robot or Robot General. The second variety has turned up in several color combinations. Of these colors one with a red torso and white limbs has shown up with either silver or gold painted highlights and bearing the name Soldado Robot or Robot Soldier. Several other color combinations have also turned up but did not come labled. The second style is an astronaut style. There has been at least one generic non-Star Wars astronaut style identified and 3 Star Wars characters; Bossk, Han (original), and Luke (Bespin). Luke is the only one to have turned up with a label on the card. This nametag identifies him as Piloto Nave X which loosely translates to Pilot Ship X or X-Wing Pilot. All of these figures can be found in red, blue, or white space suits with varied paint ops. It is worth noting that the space suit is also bootlegged. It’s based on the Fisher Price Adventure People astronaut. PPL figures came packaged on generic space cards that bear more than a little resemblance to the Russian bootleg figures. Much like the Russian, Polish, and Hungarian figures the bubbles are stapled to the cards. None of the figures came pacakged with weapons or other accessories. The astronaut based figures also came in a second type of packaging, boxed with a Lunar Rover. No other segment of the Star Wars action figure hobby continues to have as many new discoveries as that dealing with bootlegs, knock-offs, and other unlicensed collectibles and maybe that's why no other segment seems to hold my interest as much. *The Vader figures have white limbs with those colors just being used for the torso.